An incredible way to simply roast GARLIC to its rich caramel luscious state. Here is my very clever method on how to roast garlic to get the buttery cloves or garlic purée treasure out of every bulb.
. Pre-heat the oven to 375F/190C/Gas5. Place the oven rack at the bottom level.
. Use a 12 unit muffin pan and distribute the paper liners throughout .
. Slice off the top parts of each garlic bulb head...enough to expose them .
. Pour the olive oil in each liner.
. Place the garlic's cut part down in each individual muffin holder.
. Cover the pan completely and wrap tightly with one piece of aluminium foil.
. BAKE for 35-40 minutes depending on garlic head sizes. super great idea as I can freeze the heads also; thanx! Oh that is so yummm.. !! Omg, I am so glad I found this post! 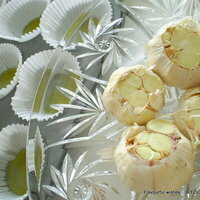 I asked DH, since he was going to the grocery store, to pick up a net bag of garlic bulbs (they usually contain 3 bulbs). He brought home a net bag of garlic all right...one that contained 36 bulbs!!! It's a good thing we like all things garlic, lol. Thanks for sharing, it was truly a time saver, and worked like a charm. Super Idea. It certainly makes more sense than the one at a time method. What a great tip and idea! I used to roast one garlic bud at a time, I did not think they would freeze well. Thanks a lot Foodessa. What a great idea, I have roasted one head in the oven, but didn't know you could freeze the garlic.